Protect your bike against theft with Sportneer's Secure Advanced Bike Chain Lock. The 5-digit combination allows up to 100,000 possible codes making it nearly impossible to crack. Best of all, it allows for keyless convenience. It is built to last, with durable cut resistance cable made from manganese steel and an protective exterior coating to prevent from scratches. 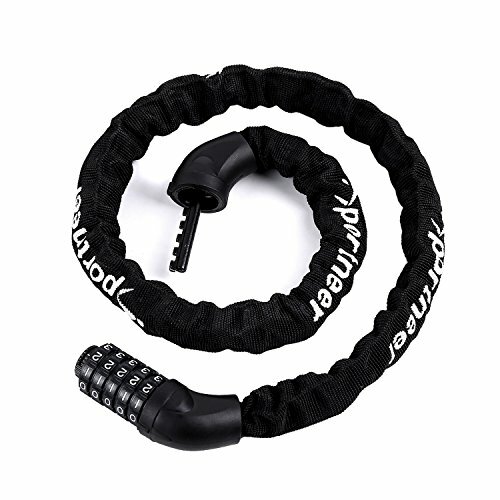 This bike lock is 3.2 feet long, ideal for bicycles, bike, ladders, lawnmowers, gates, fences, tool boxes, bbq, sport equipments and etc..
Buy this Sportneer's Anti-theft Bicycle Chain Lock, and you can have peace of mind knowing your bike is locked and secure. -Package Dimensions: 6" x 4.8" x 2.8"
The original password is: 00000, the replacement of the new password: the digital dial five to zero scale, unplug the rear lock core inside a iron knob, 90 degrees clockwise turned it on, then you can turn the new password settings need to be replaced (at the digital scale the iron knob counterclockwise) 90 turn back. The new password set successfully. After locking, must remember the new password, the digital dial chaos, people do not know your password, it can not open. LONG FLEXIBLE CABLE: This bike lock is 3.2 feet long, ideal for bicycles, bike, ladders, lawnmowers, gates, fences, tool boxes, bbq, sport equipments and etc.. If you have any questions about this product by Sportneer, contact us by completing and submitting the form below. If you are looking for a specif part number, please include it with your message.